Our prompt at 52 Photos Project this week is to take a photo of a place where we meet with friends. I have a monthly ritual of going out with my girlfriends for dinner. We always pick a fun restaurant somewhere in the city and it's a great time to catch up, laugh, cry and share what's going on in our lives. 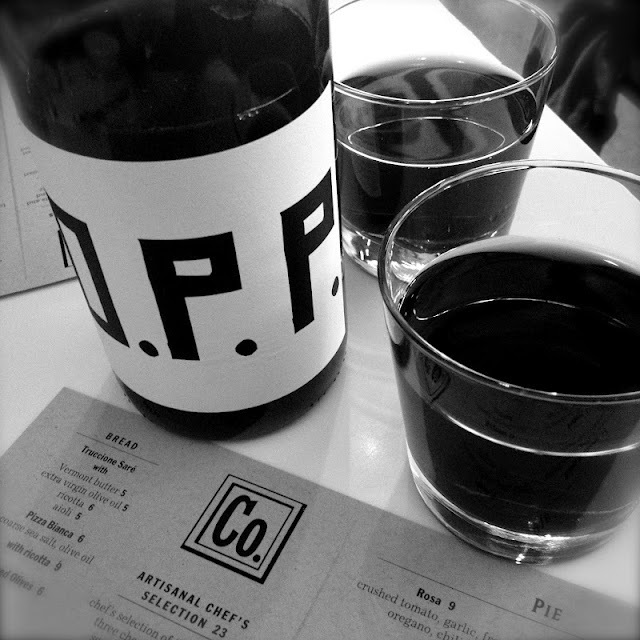 Whenever it's my turn to pick the place there's a good chance we are going to end up at "Co. (pronounced Company)--one of my favorite restaurants. In my opinion, some of the best pizza in NYC...a bit different than your normal "slice" but so worth the trip. I was there the other day with my husband (he loves it there too) and took this shot of our wine glasses because I like that label on the bottle! The hubs and I have been on a detox diet for the last three months so this outing was a big treat for us--to have wine and pizza for the first time in a long time. Yum! The wind was blowing so hard and the river was whooshing by so fast, you can't really tell from these photos but it was kind of creepy. love the last pic...the water is really creepy! I love your post today. We have so much in common. I love lunch rituals with friends. Yay for pizza; wine with a cool label; indulgences, shared. Yay for you, for giving yourself a meal away from your detox. Definitely good to take a break once in awhile. As always, I love your images! that bridge image is extraordinary! I love seeing nyc through your lens. Oh gosh I hear you about the rain...it's been non stop here! That last photo is wicked! Beautiful B&W - makes me yearn for New York! Love the wine shot...the graphics are fabulous! The swirling waters are ominous. Spooky!! I like the label on the bottle too, nice to have a night out! It's always a great day when I get a chance to check out what you've been working on, U.M.! came over from the 52 photos project. Pizza and wine = puuurfect! Love the pics, especially the one of the bridge! The processing is great. Great post and thanks for the restaurant recommendation! Beautiful ~ I must check out Co! Thanks for linking up this week. gorgeous shots, love the second one!